I've always been interested in the weather. We learn about it in school and get daily mini-lessons each day on the news. Teachers show us how to watch it scientifically with weather stations in schools across the country, and there are thousands of everyday people studying it out of pure curiosity. So the approach of Hurricane Sandy and the unique weather associated with it piqued my interest once again. Now it's time to teach myself about weather at home and become a meteorological citizen scientist. 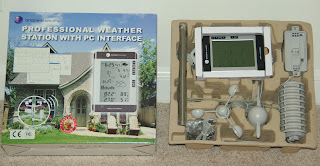 The last blog post discussed all my requirements for a home weather station and how I ultimately chose the Ambient Weather WS-5300 as the right equipment for me. I placed an order through Amazon and it arrived mere days later. Opening the box my first impression is that pieces are smaller than expected and the plastic does not look very rugged. Though upon closer inspection they do seem tough enough to handle the job (we'll find out soon enough when Sandy arrives). Setting up the weather station took a bit over an hour. While it really is not too complex and the instructions are relatively clear, there were a few hiccups and I had to undo a few things after installing them the wrong way. I also didn't realize the need for a precision screwdriver for many of the screws and bolts (make sure to fish yours out of the tool shed before getting started). Now that I've set up once I could probably install another in just 10-15 minutes, but this first time took much longer. Once all the connections are tightened and the wires strung it's time to set up outdoors. When choosing a site make sure to stay at least 5 feet away from any structures (or trees) and at last twice as far from the highest structure as it is tall (so if your house is 30 feet tall make sure to be at least 60 feet away from it). This will keep the wind blowing straight and ensure the rain does not get blocked. You'll also want to find level place to either stake down the weather station or put down a very heavy stand. This does not come with the station but really is needed...especially if you are setting it up for a hurricane. In my case the metal stand for a patio umbrella does the job quite nicely but you may have other options at your site. 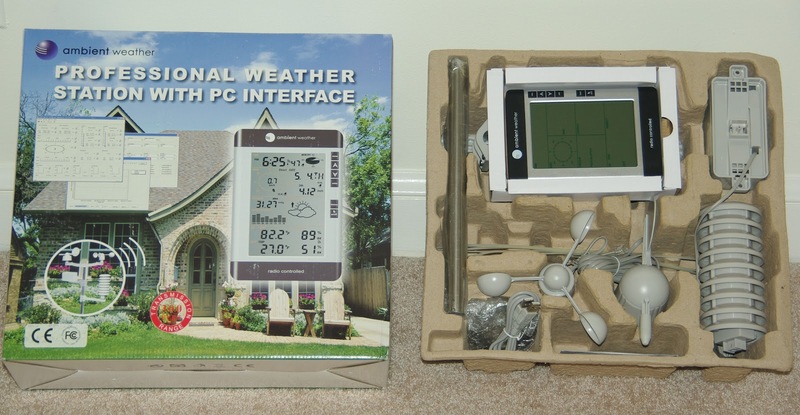 If you have problems check out the Ambient installation site for tips and tricks for selecting a weather station location. You'll see mine set up at the top of the page here, in my backyard but away from all the surrounding trees. Once installed, aligned to the North, and with 2 x AA batteries installed, it's time to for the electronic installation. Everything flows through the weather console to the computer so we start with the console first. Just add 2 more AA batteries and set the date/time. Took less than a minute and I can already watch weather readings coming in wirelessly from the station outside. Fortunately no wireless set up is required (phew!) Next plug the console into a PC with a USB cable then install the EasyWeather software included in the box. It also loads in less than a minute, though starting it the first time requires actually right-clicking on the program and choosing "Run as Administrator". But besides that awkwardness the start-up is simple. You know have the same information showing on both the weather station console and your own monitor, and you can use both to see the current conditions. Once the set-up is fully complete the computer provides many tools for analyzing, graphing, and reporting the collected data. So for now I will let the machine keep collecting information and watch what happens over the next 72 hours. Once we have some interesting data come in the next post will be all about the interesting things we can do with it. During this time I recommend following the Washington Post's Capital Weather Gang for continuing updates on the storm. They provide similar forecasts that others do, but they also provide a large amount of educational information about each prediction focused on weather buffs and citizen scientists like ourselves. So you can follow the storm and get an education as well. I am a Mac users, will the PC analysis tools still work. If not, is there a Mac compatible unit you would recommend. Good question. Apparently the recommendation for Mac users is a program called "WeatherSnoop" - http://www.weathersnoop.com/home/ or on the Ambient Weather web site at http://www.ambientweather.com/webbweathersnoopemail.html.